You've found the “U.S. 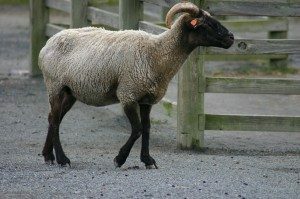 Hog Island Sheep Breeders” page here at Hobby Farm Wisdom! If this is the first time you have visited our site: Welcome! Hog Island is a barrier island off the coast of Virginia. The sheep here evolved to the island’s natural selection for hardiness, foraging ability, and reproductive efficiency. Most of the sheep are white wooled, though about 20% are black. Newborn lambs are frequently spotted over the body, but the spots usually disappear as they grow. Wool from this breed is of medium weight with fleece yields ranging from 2 - 8 lbs. The sheep will naturally shed their wool slowly each year, but most owners choose to shear them. Ewes may be horned or polled. Rams can have horns or are somewhat polled. Mature they weigh between 90–150 pounds. The ewes most often give birth to twins. Hog Island sheep are excellent foragers and prefer to browse rather than graze. They stay in very tight flocks and are extremely alert in nature.